Castle Pines Village residents Christie and Charles Jones enjoying a night out at Yard House. Yard House opened its doors for business on July 1 in The Vistas at Park Meadows Mall. Former Denver restaurant owner and Yard House founder, Steel Platt, brought his vision home after opening the first Yard House restaurant in Southern California in 1996. The recent Lone Tree opening marks the third Colorado restaurant (also Denver and Lakewood), with Yard House restaurants located in twelve additional states. Named for the 3-foot-tall glass containers holding a "yard of beer," Platt combined components from many of his former restaurants and also borrowed elements from The Boiler Room, one of his successful Denver establishments in the late 1980s. He focused on a large selection of draft beers, ranging from classic lagers to less traditional ales, and encapsulated all of the decorative and colorful taps within the center island of the bar. Although the beer selection (partially pictured above) is certainly a signature component, the bar also serves a large selection of fine wines and spirits. Key to the restaurants' success is a non-stop playlist of classic rock music, which Platt personally selects for each restaurant location still today. The up-beat atmosphere makes this a new hot spot for after-work happy hour goers. Join the Yard House crew for half-priced appetizers and pizzas during happy hour on Monday through Friday from 3 p.m. to 6 p.m., and late nights on Sunday through Thursday from 10 p.m. until close. Seating throughout the restaurant is spacious, and the industrial-style decor mixes with upscale sophistication to invite those in search of a little more elegant evening as well. Be sure to take advantage of The Vista's valet parking service. And what of the food? 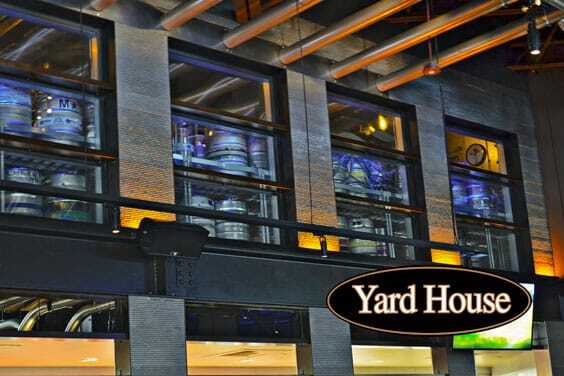 Yard House features an extensive menu of American fusion cuisine, including appetizers, salads, sandwiches, street tacos, pastas, individual-size pizzas, grilled burgers, ribs, steak, and seafood. And last but not least, experience one of the mini-dessert options unique to Yard House. Vegetarian items are marked throughout the menu, and choices of a chicken or beef substitute are made from wheat, soy, pea proteins, grains and vegetables. Several items on the food menu can also be modified for gluten-sensitive guests. The Kids Klub menu includes fresh-to-order favorites, including a selection of healthy items for Yard House's younger guests. 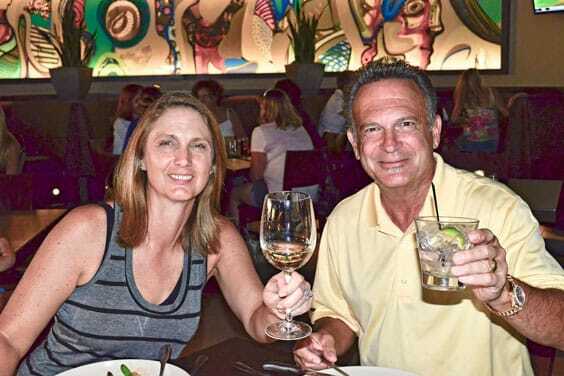 The Castle Pines Connection caught up with a local couple dining at the Yard House and got their take: "The Atmosphere is fun and light, and the food is excellent," according to Castle Pines Village resident Charles Jones. "I would recommend it to anyone!" This was Jones' second visit to the restaurant and he is a fan. Yard House is located at 8437 Park Meadows Center Drive in Lone Tree. Hours of operation are Monday through Thursday from 11 a.m. to 1 a.m., Friday and Saturday from 11 a.m. to 1:20 a.m., and Sunday from 11 a.m. to12:30 a.m.
For more information, call 303-790-7453 or visit www.yardhouse.com. Nearly five miles of beer lines flow overhead, directly from the above-pictured keg room to the bar, allowing patrons to experience the delivery process. 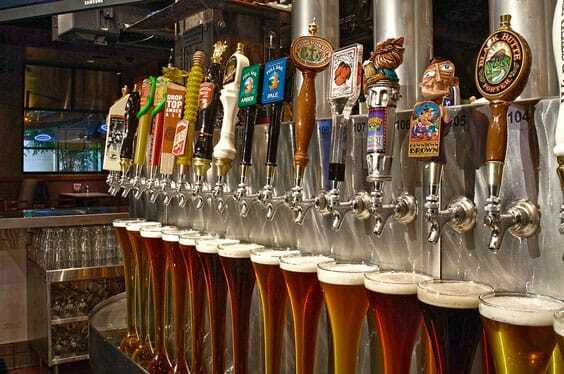 Perfectly-chilled draft beers are served by the half-yard, pint, or six pack sampler.